This was wonderful, selfless music-making. Within a few years of its formation, the Quartet garnered the first Cleveland Quartet Award and the Naumburg Chamber Music Award; and in 1996 the Chamber Music Society of Lincoln Center invited them to be the inaugural members of Chamber Music Society Two, a program which was to become a coveted distinction for chamber groups and individuals. The Quartet had its first European tour in 1997, and was honored in the U.K. with the Royal Philharmonic Award for Most Outstanding Debut. That debut recital was at Londons Wigmore Hall, and the Quartet has continued its warm relationship with Wigmore, appearing there regularly and serving as the halls Quartet-in-residence in the 2000-01 season. 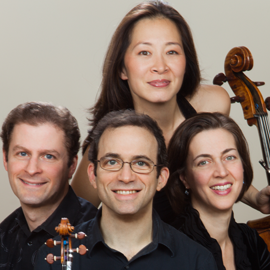 Closer to home, the Quartet has served as the Resident String Quartet at Princeton University since 1999. In recent seasons the Quartet has traveled widely, appearing all over the United States and Canada, in Europe, Japan and Australia. It has performed in the worlds most prestigious venues, including Carnegie Hall and Alice Tully Hall in New York; the Library of Congress in Washington; the Concertgebouw in Amsterdam; the Konzerthaus in Vienna; Suntory Hall in Tokyo; and the Sydney Opera House. The Quartet has participated in summer festivals such as Aspen, the Music Academy of the West in Santa Barbara, the Edinburgh Festival, the Kuhmo Festival in Finland, the Taos School of Music and the Caramoor Festival. The Quartet has recorded the Opus 71 Quartets of Haydn, and has also recorded a Mozart disc for Aeon Records, consisting of the K. 464 Quartet and the K. 593 Quintet, with violist Hsin-Yun Huang. In the area of newer music, the Quartet has released a disc of the music of Steven Mackey on Albany Records, and has also recorded the music of Bruce Adolphe, Chou Wen-chung and Charles Wuorinen. The Quartet is named for Antonie Brentano, whom many scholars consider to be Beethovens Immortal Beloved, the intended recipient of his famous love confession.